The Bible talks about how Iron Sharpens Iron. That is exactly what we do in our exclusive men's Mastermind groups. Meet via Video Conference once a week. Connect on a private social media site. Get access to members only area. Starting at $425 per month with a six month commitment. 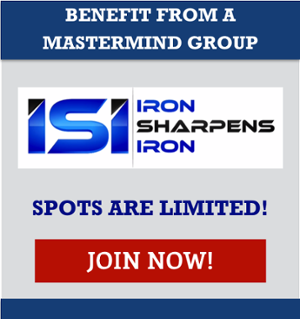 To find out more information about this exclusive Men's Mastermind, click on the banner below.